The Coogee Pavilion located in Sydney’s Eastern Suburbs was launched by Merivale in winter 2014. With a relaxed beachy setting and a wide range of casual dining dishes, The Coogee Pavilion is already considered an iconic landmark in Sydney overlooking the famous Coogee Beach. The internal structures of this restaurant expose a raw and industrial character decorated with crafts from local artists and a whale theme honouring the history of the whale migration that passes through the waters of this area. Due to the location of the Coogee Pavilion on the water, the main concern was that the venue would be susceptible to southerly winds particularly in the afternoon. Devex Systems worked directly with Justin Hemmes, CEO of Merivale to ensure their customers would receive optimal natural comfort from these energy efficient heating panels. A single high capacity Comfortline panel costs about 60c/hour # to run whereas a typical mushroom heater on bottled gas will cost five times that — up to $3.00/hour^ – these panels offered a cost-effective and energy efficient solution to other heating methods. 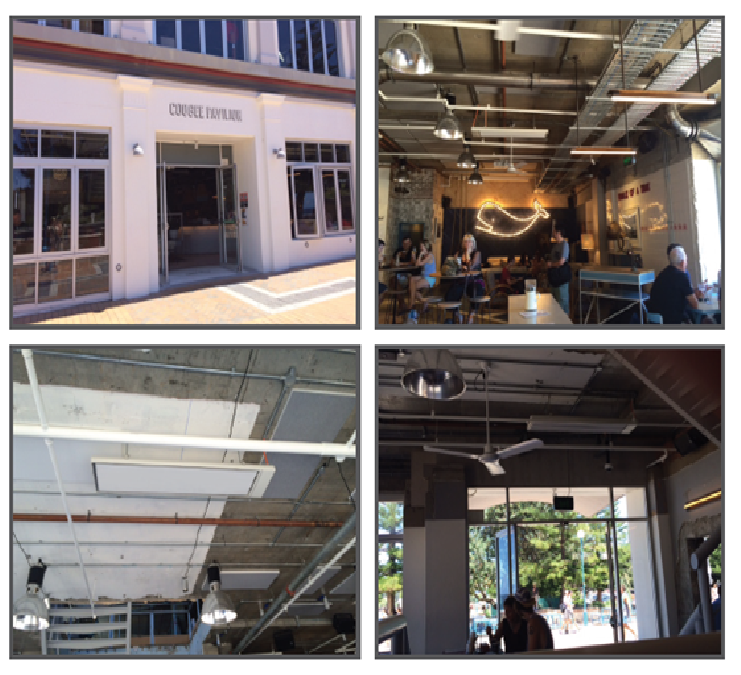 Comfortline Excel Overhead Heating Panels were installed throughout the Coogee Pavilion Hotel to offer efficient heating throughout the venue. There were 36 panels installed in total, 24 X Comfortline 36s and 12 X Comfortline 12s. 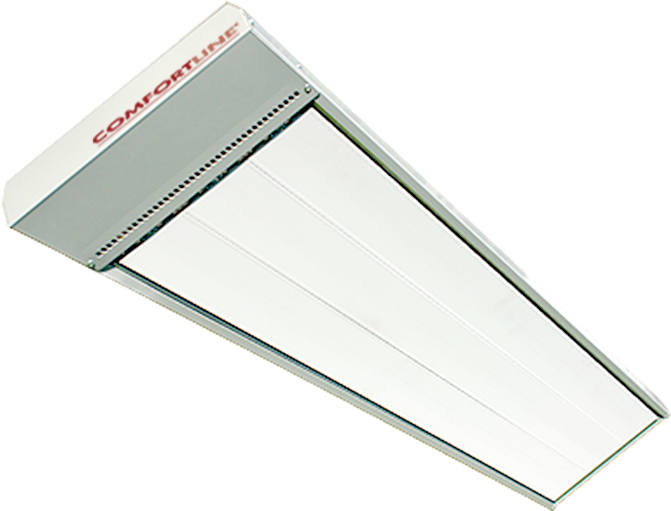 The European-made Comfortline Excel is an upgraded model of the Comfortline Original series setting an even further refined standard for the quality and workmanship behind these high temperature overhead heating panels. These panels reflect over two decades of manufacturing and design expertise and experience. ENERGY SAVINGS & PRECISION COMFORT: Comfortline Excel panels emit up to 10% more usable heat than similar panels on the market thanks to their unique surface treatment. These panels have a high level of heat emission thanks to their unique “silicating” treatment on the heating surface which increases the actual surface area, ensuring the highest possible level of heat emission from the surface of each panel. These panels are also packed with high quality wool insulation that reduce heat loss upwards and make them extremely efficient to run. The Excel model has two anticorrosive coatings that are applied to metal sheet parts made from AluZinc. Connecting material is also made from the same material and thus electrochemical reactions and the corrosion of parts is less likely to take place. The panels are a modern design with off-white powder coated steel case. INSTALLATION & MOUNTING: Installation is easy in new or existing buildings. You can mount the panel directly overhead (brackets supplied), suspend or recess them. Comfortline is perfect for overhead spaces as low as 2.4m, right up to 8m. The Comfortline Excel panels are a cost-effective and efficient heating solution for hard-to-heat areas that yielded excellent results keeping both staff and customers warm and comfortable while they enjoy their dining experience. These panels were designed based on the science of radiant heating to ensure that people and objects are heated as opposed to the air. This ensured a natural and gentle warmth for the Coogee Pavilion patrons as opposed to a dry heat from forced air or localised spot heat from a mushroom heater. Liebherr is an international leader in the manufacturing of construction machinery specialising in cranes, aircraft parts, and mining with over 38,000 employees in over 130 countries, Liebherr has been long-standing for over 32 years. The Erskine Park, NSW facility was newly built in 2012 with a number of workshops designed for the repairs and maintenance of crane machinery. With over 80 staff in this facility, ensuring comfortable working conditions throughout the year was of utmost importance. The size of the space heated with high efficiency Schwank Gas Radiant Overhead Tube Heaters was approximately 2600m2 with a mounting height between 9.5m-12m and 4 zones. Air changes were estimated around 1.5 per hour and the estimated heat loss of the facility was approximately 580 kW. The team at Liebherr, Erskine Park wanted a solution that not only satisfied staff comfort levels, but would also conserve energy and reduce long-term running costs. Liebherr-Australia commissioned Thiess, a leading construction and services contractor in Australia for the construction and redevelopment of the Erskine Park facility. Additionally, the exclusive distributor of Schwank heaters in Australia, Devex Systems, worked directly with Liebherr and Thiess to co-ordinate, design and oversee the installation of this project. For several years now, Liebherr has standardised facility heating using only Schwank heating on an international scale – a true testament to the superior quality of this product. Schwank Gas Radiant Overhead Tube Heaters were therefore specified as the obvious choice for heating the Erskine Park location. Twelve calorSchwank tube heaters (5 x 40U & 7 x 30U) were specified in the design for this application after taking into consideration the large enclosed area of the space that required heating and its ceiling height. The designed comfort setting for the area being heated was 16°C as measured by a black bulb. The calorSchwank ensured low running costs and a fast pay back as the heaters were required to run for long periods of time. The radiant heat factor of the calorSchwank was extremely high sitting at 70% and its modulation capabilities allowed for better overall control of the system and higher efficiency. The design of these heaters helped to minimise the amount of convection heat thereby achieving a high radiant factor and improving the efficiency. 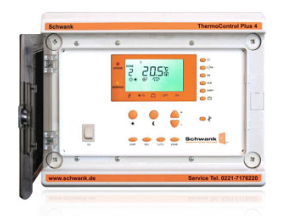 A single Schwank ThermoControl Plus M4 controller applied to 4 heating zones at the Erskine Park facility was used to control the heating system. It was also set up to control the Ridge Ventilator, enabling appropriate ventilation and the proper disposal of combustion gases when the burners were running. Schwank Gas Radiant Overhead Tube Heaters are a high efficiency heating solution that yielded excellent results across financial, operational and environmental fronts. These systems allowed for optimum temperature control throughout all zones which resulted in improved comfort for all staff. These German-made tube heaters have a fast pay-back and have proven their exceptional efficiency reducing energy consumption by up to 50% when compared to traditional heating systems used to warm large spaces.